• On Day One, weight yourself and take all your measurements. Mark the information in a notebook or noting medium of your choosing. Take full body and full face ‘before’ pictures. 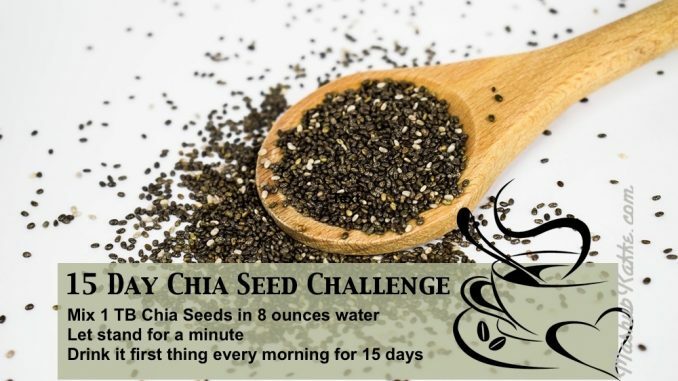 • Beginning with Day One and each day following for 15 days, drink the chia mixture noted above ( with or without 1 teaspoon of collagen protein) when you wake up. • On Day 15, take full body and full face ‘after’ pictures. • Weigh yourself only on Day One and again on Day 15. Along with proper eating and moderate movement, you should find that you have more energy and look better at the end of the 15 days. From weight loss to disease prevention, this little seed offers an enormous amount of nutrition. Provides Protein. It’s a plant-based protein, so you don’t need to worry about soy. Each serving has about 6 grams of protein. Great Source of Gluten-free Fiber. Finding dense sources of fiber can be tricky when you’re gluten free. One ounce delivers about 10 grams of fiber. Stables Moods and Energy Levels. The improved blood sugar regulation from the gel that’s formed in your stomach helps stable your mood and increases your energy levels. This causes a slower release of glucose into your blood stream and improves insulin sensitivity. Offers Tons of Omega-3 Fatty Acids. There’s about 5 grams per serving of omega-3 fatty acids. Omega-3s are critical to fight heart disease. Fights Metabolic Syndrome. Chia seeds lower blood pressure, cholesterol and blood sugar. Learn more on metabolic syndrome. Offers an Array of Micronutrients. Loaded with calcium, magnesium, manganese, iron, phosphorous and folic acid, just to name a few. Think of those nutrients as an army in your body building strong bones and teeth, improving cardiovascular health and decreasing stress. Helps With Weight Loss. Supposedly chia seeds are supposed to expand in your belly, which helps you feel full so you won’t over eat. Adding one ounce of chia seeds to your diet can significantly reduce your daily caloric intake.